Hiding in the Flowers is a classic design by Linda Gillum for Kooler Design Studio. 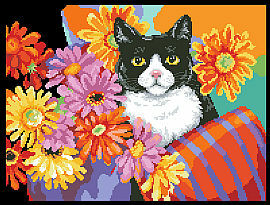 The plush tuxedo cat peeks out at the viewer from behind bright gerbera daisies and colorful cushions. This is a great design for either the modern or retro home.